Can never get enough Hollycaust! This movie is well acted and has wonderful animation and photography. This is a very moving story based on a really talented mans life. I would see it again. Absolutely loved it! Rather slow and alot of animation. The preview tells the entire story. This movie is in simple terms about a cross dresser and alcoholic who mistakenly reveals this in a bar to strangers he meets. Big Mistake! A really different movie that kind of hides its true subject for a while. Well done and very creative presentation of a true story and character. 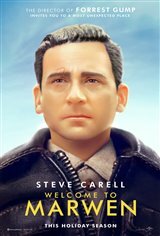 Steve Carell is outstanding. Go see it if you are not hung up on action heroes or being macho. For Adults. Carell is a fine actor. Story line had potential. Was extremely slow and boring. Way to much animation. Not enough acting and emotion. Found it to be incredibly boring and couldn't wait for it to be over! Just because a film is based on actual events does not mean it will be interesting. I find it very telling that there seems to be two different mindsets about this movie, half giving it five stars and the other half, one star. I am of the latter persuasion. I don’t know what the haters were expecting! Complicated story told in a creative manner. Captured the essence of the injuries Mark lives with and the essence of Dames! Worth the view! Happy New Year Mark! New movies in theaters - Mary Poppins Returns and more!